107 min. IFC Films. Director: Kelly Reichardt. Cast: Michelle Williams, Kristen Stewart, Laura Dern, Lily Gladstone, Rene Auberjonois, James Le Gros. Writer-director Kelly Reichardt still believes in cinema. That’s partly evident in her choice to shoot her latest feature, Certain Women, with a film camera, rather than a digital one, but more so in her commitment to her art form’s humane possibilities, her willingness to explore powerful loneliness and frail connections, silences and open spaces. Open spaces are part of the landscape of Certain Women, a Montana-set trilogy of tales adapted from the short stories of Maile Meloy (specifically, "Travis B.," "Native Sandstone" and "Tome”). “Big Sky Country” lends itself perfectly to Reichardt’s preoccupation with how small and alone we can feel in the vastness of the American landscape (in films like Meek’s Cutoff and Wendy and Lucy, both starring Michelle Williams). By being land-locked and mountain-ringed, Montana allows for the sense of isolation but also of confinement. Certain Women begins with Laura Wells (Laura Dern), the wearily sympathetic lawyer to a troubled divorcee named Fuller (Jared Harris). Fuller quickly proves more pitiable than likeable. His crippling health issues and worker’s comp case fuel a simmering anger, and although Wells is a highly capable lawyer, her client blithely belittles her with casual sexism, seeing her not as an intelligent professional, but as a feminine archetype. To some extent, Wells feels compelled to play the roles expected of her by Fuller and the local police, most notably in a climactic crisis situation that puts demands on her sensitivity. The second story concerns Gina Lewis (Michelle Williams), a wife and mother pushing toward her goal of a dream home but possibly at the emotional expense of an elderly neighbor named Albert (Rene Auberjonois). Gina and her husband Ryan (James Le Gros) visit Albert to sweet-talk him out of a large pile of sandstone on his property. Since the sandstone has personal meaning to Albert, Gina feels the tug of guilt while clinging to her certainty that the sandstone might as well go to her own practical use. The third story is that of Jamie (Lily Gladstone), a rancher who stumbles upon a class in town that compels her not because of the subject matter (education law) but rather the teacher, a harried young law student named Beth (Kristen Stewart). Jamie tests the romantic waters with Beth in a tentative series of brief encounters. Reichardt’s screenplay lightly stitches the stories together along the way, reminding us that these women share time and space. Reichardt in no way pushes her material, instead giving the viewer the space to live in this space with the characters, observe them and listen to them, and then draw one’s own conclusions about thematic import. The points Certain Women has to make are very quiet, not with dramatic fireworks but with three breaths of cinematic fresh air. Criterion's excellent special edition of Certain Women begins with sterling A/V specs. A 2K transfer makes the most of the unusual 16mm source material: color is true, and film grain natural, for an image that presents the film exactly as it should look, the occasional wart and all (the image is clean but with the occasional minor flicker or fluctuation in resolution). The DTS-HD Master Audio 5.1 mix captures the subtleties of immersive ambience heard in theaters while prioritizing dialogue. Like the picture, the sound doesn't miss a trick in preserving the filmmakers' intent. 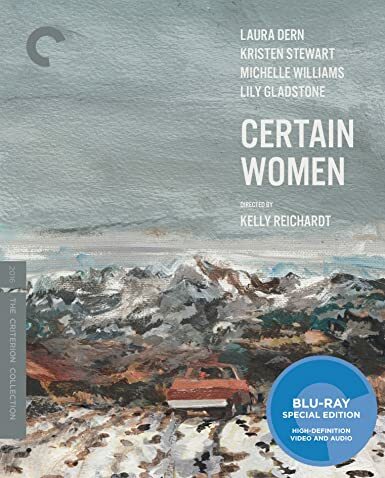 Bonus features include new interviews with director "Kelly Reichardt" (14:13, HD), executive producer "Todd Haynes" (14:35, HD), and author "Maile Meloy" (13:12, HD), on whose stories the film is based. Reichardt discusses the source material and her choices in adapting it, including to film in Montana on 16mm film; Haynes discusses Reichardt in her style and skillset, their collaboration, and their friendship; and Meloy talks about her stories on how they came to be adapted by Reichardt. There's also the film's "Trailer" (2:01, HD) and a pamphlet with film credits, tech specs, artwork, and an essay by critic Ella Taylor, "Trapped Under the Big Sky." All site content © 2000-2019 Peter Canavese. Page generated at 04/18/2019 01:22:37AM.